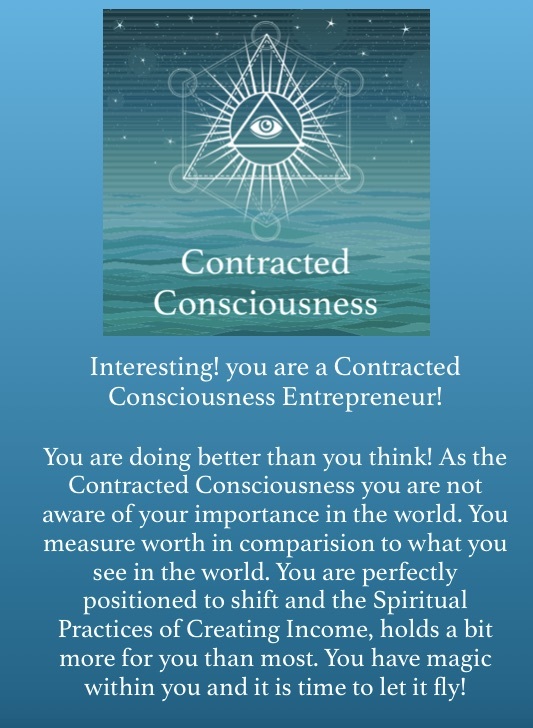 What Is Your Entrepreneurial Consciousness Quiz? | Susan Lustenberger | What If You Could? 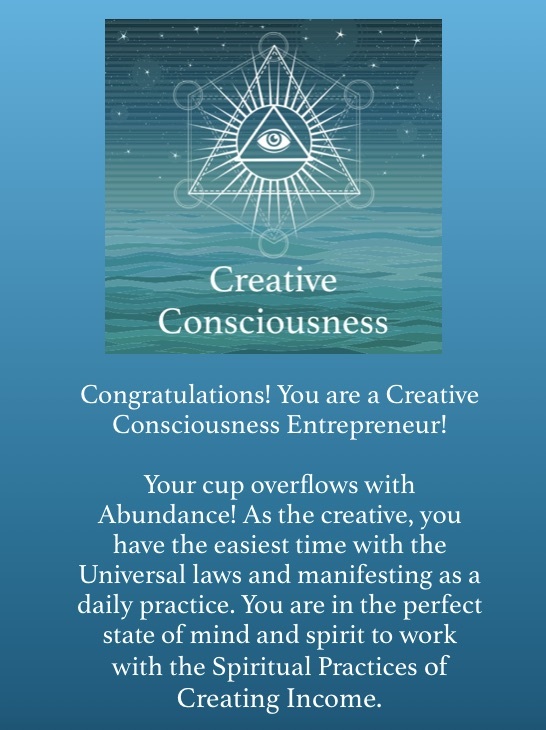 What is your Entrepreneurial Consciousness Quiz? 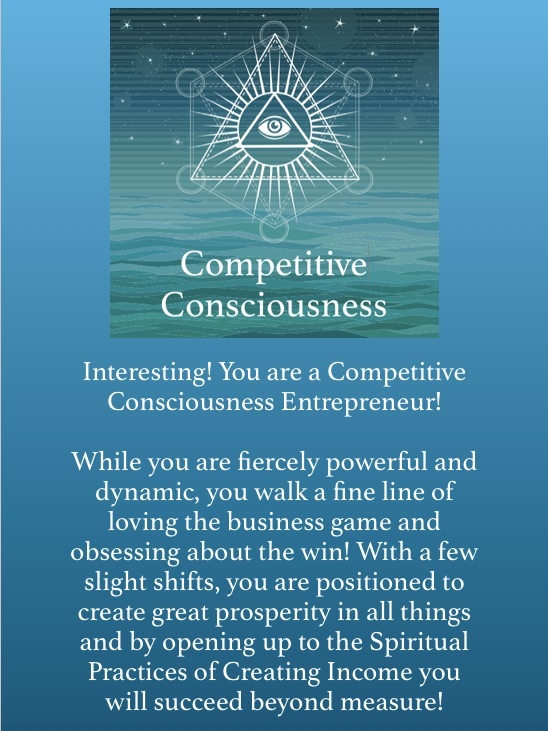 Here is a summary of your Entrepreneurial Consciousness. The mere fact that you have birthed this bad boy into existence and all that comes with that. It’s the best that exist out in the market, your killin’ it! It helps so many people and with a bit of luck and a lot of hard work you will get some notoriety in your industry. Feels like most days, you can’t remember why you even do this, but when you really think about it, it’s about doing what you love to do. 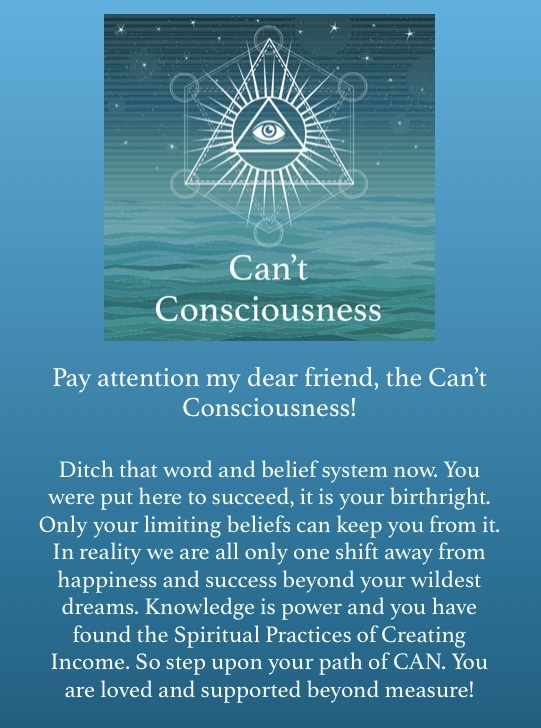 Keep this badboy to yourself until you are sure that you have thought through it all and want to move forward, it’s far too risky to “put out there” if you are not ready to act and reap the rewards. Do some research and realize that similar programs or products are already out there. Second guess your idea because the others seem so great and why would someone really want yours anyway. Feel conflicted because you KNOW this would be wildly successful, but you don’t know how you would go about it and in the end these things seem to fail more than they succeed. Take your counterpart to a celebratory dinner to let them bask in the light of prosperity and your support. You know that they have just up’d the game for your industry. You are crushed, that idea has been swirling around in your head for a year. Now someone else will reap the accolades and financial success that should have been yours. You are blown away at how easy it is for your competitors to get things done in the industry. Why bother, when success truly seems to be for everyone but you. How do you feel when you talk about what you do? Totally lit up and ready to inspire others. A bit cautious, I don’t like to give away too much. I sometimes have a hard time getting it out, I want to sound like I know what I am doing. Elevator pitches aren’t my thing, I don’t like to brag. In your line of work what do you worry about most? Client care and the success of our work together. Capturing Market Share and being #1 in my field. What my colleagues and counterparts think of my work. Being seen as a leader in my industry. Money and keeping my business afloat. Which of these sentence’s endings resonates with you the most. I am so lucky for the work I get to do and love the people I work with. What do I need to do today to be #1 in my field? Just a few more fires to put out and everything will be just fine. How am I going to get through this day with all I have to do? Post it to all social media outlets and email to all clients, colleagues and competitors, You want the world to engage. Pay more attention to the analytics and industry	reporting on the backend than real time feed back of clients and colleagues and competitors. Get a sinking pit in your stomach. Now that its live, you notice everything you didn’t do that would have really taken it to the next level. Breathe a huge sigh of relief that that nightmare	is over. Now on to the next project! Feeling my heart light up. I have a hard time feeling inspired. Being of great help to people. Know the perfect person that could do the job and still work within their budget, you refer it immediately! No way do you make that referral, no need to just give away the business. Find a competitor who is willing to do the work but bill it through you. No need for you to go without the income, especially if the illusion of working within the clients budget secures the job for you. Begrudgingly reduce your rate, because you need the job, but make it clear that this is compromising your business model and you are really tight on money yourself. When you experience a bad day in business, you…. Ask yourself, what did I do that created the day I had and how can I be better tomorrow. Check up on what’s going on in the business world, it always makes you feel better to know that you are not alone. Get frustrated with the people that you interacted with today, they can be so frustrating. Wonder why the Universe seems to be against you lately and call it a day and accept the bad mood. You are at a conference and a group of movers and shakers in your industry are sitting at a table eating lunch with a few empty seats, you. Ask if “this seat” taken and pull up a seat, the more the merrier. Get you own group together and sit close by, you never know what you might overhear. Slink away and stew as to why you weren’t invited to the “cool kids” table. You will take the table farthest away from them please. Look at the words below and pick the one that resonates the most within 2 seconds.